Gao Maohu (55) and He Gailan (49) can trace their roots in the Kubuqi Desert of China's Inner Mongolia Autonomous Region back through more than six generations of herdsmen. When the pair married 30 years ago, their dreams extended no further than the next sand dune, and it looked like their future would follow the same hard-scrabble course as the one followed by their parents and grandparents. But now, thanks to the work of Elion Resources Group, their future is significantly brighter. They have a comfortable home, and they can afford nicer things like a car and nice clothes for weddings. Now they can afford to send their son to university, and he can come back to good prospects managing his family's Chinese medicinal herb and organic fruit and vegetable farm. "When I married my husband, all the local girls wanted to find husbands outside of our area," He Gailan said. "But now girls from outside of our area all want to marry husbands from here! It's quite a big change." 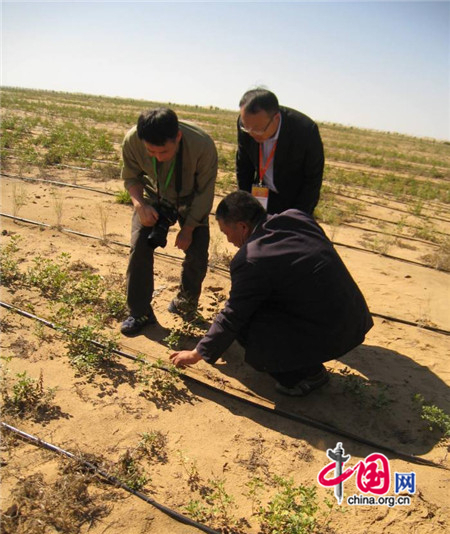 Elion Resources Group has been conducting afforestation and desert management projects in the vast 18,600-square-kilometer Kubuqi Desert, the seventh largest desert in China, since 1995. Working together with thousands of local residents and the support of local and provincial governments, the company has succeeded in reclaiming over 5000 square kilometers of desert, mostly by planting Mongolian willows, licorice root, and other desert-friendly plants. In 2013, Elion's chairman, Wang Wenbiao, won the first ever Global Dryland Champion Award from the United Nations Convention to Combat Desertification in recognition of the amazing work the company has done. Elion began in 1988 as a small company mining a salt field in the Kubuqi Desert and producing salt-related chemicals, but the company was plagued by the high cost of transporting their products over sandy terrain through an area that had no electricity and no transportation infrastructure. In 1995, Wang Wenbiao convinced the regional government to lend Elion 70 million RMB to build a 65 kilometer road through the desert to the nearest rail station, but the work was quickly undone by the shifting sands. Wang and the local workers soon realized that the only way to maintain the road would be to plant plants that would take root and anchor the sand in place, and so they began the long and arduous process of developing a green belt. The success of this project led Elion to expand its goals to encompass transforming the desert into the oasis it purportedly was around 500 years ago. Much has changed in the 19 years since those first trees were planted. According to information published by Elion, sandstorms have been reduced to only three to five days per year as opposed to the 70 to 80 days per year seen before, allowing more soil retention for agriculture and decreasing the air pollution caused by wind-blown sand in places as far away as Beijing. Average rainfall in the area has also increased from 70 mm annually to approximately 300 mm annually, and ground water retention as been significantly improved. In 2013, Elion reported assets worth 22.6 billion RMB, which include a profitable 133,000 hectare plantation of Chinese medicinal herbs and recent expansions into natural gas and solar energy production. Through a 20-year process of afforestation, Elion Resources Group has transformed the Kubuqi Desert of Inner Mongolia into an oasis that can support sustainable livelihoods for thousands of the area’s residents.